Before blood orange season is officially over, I really wanted to share this simple cupcake recipe with you. The basic recipe is my staple cupcake/cake recipe I bake over and over again, and thus adapt over and over again. I have had a bit of a ‘thing’ for blood oranges this season. If you follow me on Instagram, you might have noticed! And luckily, this season seems to have been particularly plentiful. To me they are much nicer than a regular orange and I always feel some level of excitement when cutting one open - how red/purple will it be?! I have bought many whilst perusing the local green grocers on my lunch break, and carried them home on the train with either grand plans to bake something that weekend or just to juice them and freeze it for something later on. This recipe can suit either plan, use whilst the oranges are fresh, or defrost the juice later on and make when blood oranges have long gone from the markets. If making with fresh oranges, use the zest in the cake and the juice for the icing as the below recipe suggests. If you only have the juice, use that for the icing and add the zest of a regular orange to the cake batter, or substitute for one teaspoon of vanilla extract or paste. 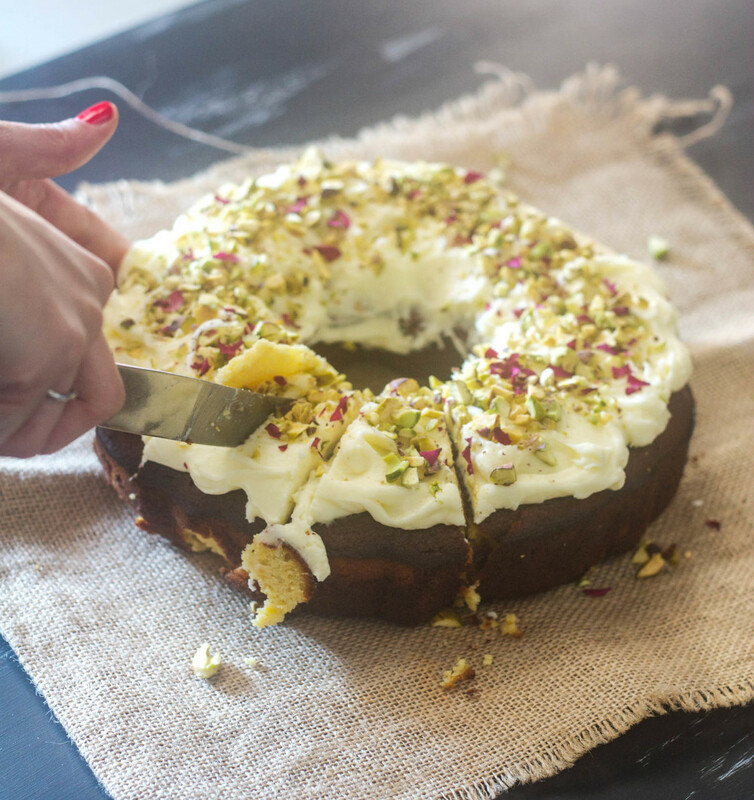 The recipe could of course be used for a whole cake rather than cupcakes, I particularly liked making it as a simple ring cake (picture below) - just remember the cooking time will be a little longer. Pre-heat oven to 160 degrees Celsius, and line a 12 hole cupcake tray with cupcake cases. In the bowl of an electric mixer, beat the margarine, sugar and blood orange zest until light and fluffy. Beat in the eggs one at a time, then add half the flour and half the milk and mix. Add the remaining flour and milk and mix on medium speed until combined. Evenly divide the mixture amongst the cupcake cases, the mixture should fill each case so they are about 3/4 full. Bake for 20-25 minutes, or until the cakes spring back when touched lightly and a skewer comes out clean. The cakes will be lightly golden when they are done. Remove the cupcakes from the tray and cool on a wire rack. Once the cupcakes have cooled completely, sift the icing sugar into a bowl. Add one tablespoon of blood orange juice, and stir. Continue to add small amounts of the juice and stir well, until the icing is a nice smooth consistency. If you find the icing becomes too runny, add little bits of sifted icing sugar until you have created the right consistency (if the icing is too runny it will just run off the cupcakes and make a mess, it needs to have a slight spreadable consistency so you end up with most of the icing on top of the cakes, rather than all down the sides). Spread icing over each cupcake, don’t worry if it runs downs the sides a little. Top with edible flowers immediately, if using. Allow the icing to set a little before serving. Cakes that have been decorated with edible flowers are best eaten the day of making. If there are any leftovers store in the fridge, as the decoration will not store well at room temperature. Otherwise, storing in an airtight container at room temperature for a few days will be fine. Many apologies for my six week or so absence from here. Though I do doubt that anyone is sitting at their computer waiting for me to post a new recipe! I have had an exciting few weeks full of new experiences and new beginnings. All of which meant time spent updating my blog were few and far between. In summary, during the last few weeks I have taken part in a food photography and styling workshop with Billy Law and Luisa Brimble, baked forty cupcakes and 20 biscuits for a bridal shower, baked 60 biscuits, made 250 mini quiches and 330 finger sandwiches for a wedding afternoon tea, quit my job, bought a new camera and attended a wonderful weekend ‘Slow Living Workshop’ with Beth Kirby, Rebekka Searle and Lusia Brimble (photos of the weekend to come!). Hopefully you will notice an improvement in my photography and styling skills soon, and fingers crossed I will be able to dedicate more of my time to this blog from now on! Below are some photos I took at the workshop with Billy and Luisa. The recipe I have decided to post today is something I created a month or so ago. I had been reminiscing about the cakes and teas Mum and I enjoyed while we were in Paris back in February. At Ladurée in Paris we tried a creation called the rose réligieuse. It was a round two layered choux pastry with crème pâtissière and raspberries, decorated with a rose icing on the outside. The flavour combinations were simply wonderful. And of course the presentation was impeccable. Tea & a Rose Réligieuse at Ladurée, Paris. I decided to create something using this as an inspiration, and came up with a raspberry and rose cupcake. I am very pleased with how they have turned out, and seem to have become an instant crowd pleaser. Pre-heat oven to 160 degrees Celsius and line two cupcake trays with cupcakes cases. The mixture will only make about 15-16 cupcakes, so you won’t need to line all of the second tray. In a large bowl, cream the margarine, vanilla and sugar until it has combined, and is fluffy and light. Add the eggs one at a time, beating after each addition. Then add the flour and the milk, half of each at a time, beating in between to combine. Once all the ingredients are combined, add the raspberries to the mixture, gently folding them in with a spoon or spatula (not an electric mixer) until evenly distributed. Evenly fill each cupcake case with the mixture, approximately 3/4 full. Cook for 20-25 minutes or until the cakes are lightly golden and spring back when touched. Once the cakes have cooled make the icing. Sift the icing sugar into a bowl, then add the water and rosewater and mix to combine. The icing should be smooth and slightly thick so it doesn’t run down the sides of the cakes. Add the pink food colouring, keeping the colour light. If the icing is too runny, add more sifted icing sugar a little at a time. If the icing is too thick, add more hot water a little at a time. Spread the icing over each cupcake and place a rose bud in the centre. 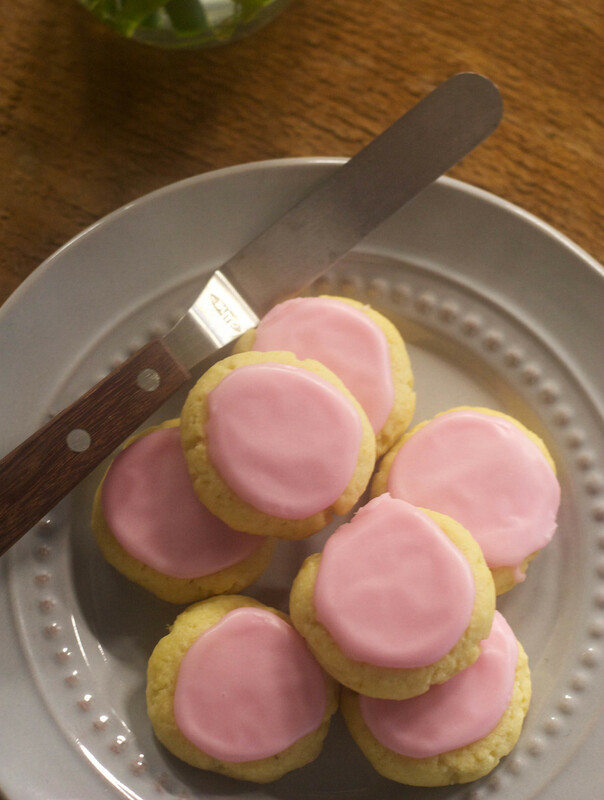 Allow the icing to dry before storing in a airtight container, or eat straight away! Original cupcake recipe from The Australian Women’s Weekly Cakes & Slices Cookbook, p.89. Originally Posted September 8, 2014. These cupcakes are ridiculously easy to make and are a crowd pleaser every time. They are probably one of my favourite things to make and to eat! The cake itself is a recipe I grew up with. My Mum would use this trusty Women’s Weekly recipe to make our birthday cakes and cupcakes. My brother and I would always fight over who got to lick the beaters when Mum made these cupcakes! Mum would ice these cupcakes with a coloured icing made with a little margarine, milk and icing sugar, I of course always wanted pink! The original recipe uses butter, however Mum has always used margarine. Margarine gives the cakes a nice light texture. She also says using a low fat milk is great for creating a nice light cake. I find this recipe makes between 12 and 15 cakes. I think it depends on the size of the eggs used, or how much batter I fill the cupcake cases with. Either way, I always line a 12 hole cupcake tray with cases, and have another tray ready in case I need it. Pre-heat oven to 160 degrees Celsius and place cupcake cases into a cupcake tray. Cream the margarine, vanilla essence and sugar in a bowl with an electric mixer. The mixture should become light and fluffy. Beat in the eggs one at a time, then sift half the flour into the mixture and add half the milk. Mix until combined, then add the remaining flour (sifted) and milk. Divide mixture between the cupcake cases. Fill them about 1/2 to 3/4 full. They will rise, and if you fill them too much they will spill over the sides. Bake for 15 minutes, or until the cakes are slightly golden in colour and spring back when touched. Cool on wire racks. Once the cakes have cooled, sift the icing sugar into a microwave safe bowl, and gradually add the pulp of two passionfruit. Mix to form a thick paste. If the mixture is too wet, sift in some more icing sugar. If it is too dry add more passionfruit pulp. Place the bowl into the microwave and heat the icing in 10 second intervals until a smoother consistency is achieved. The icing should spread nicely, but not be so runny that it will run down the sides of the cupcakes. 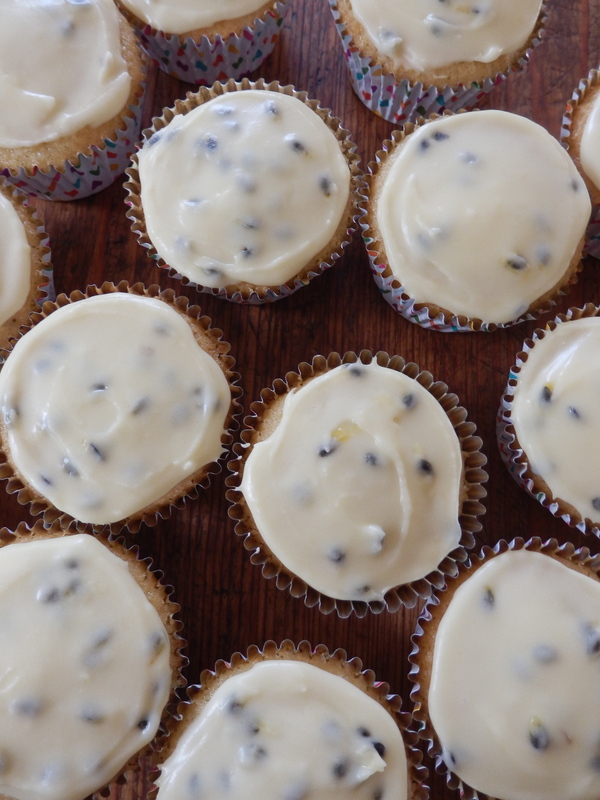 Using a knife or small spatula, ice the top of the cupcakes with the passionfruit icing. Allow the icing to set before storing in an airtight container. 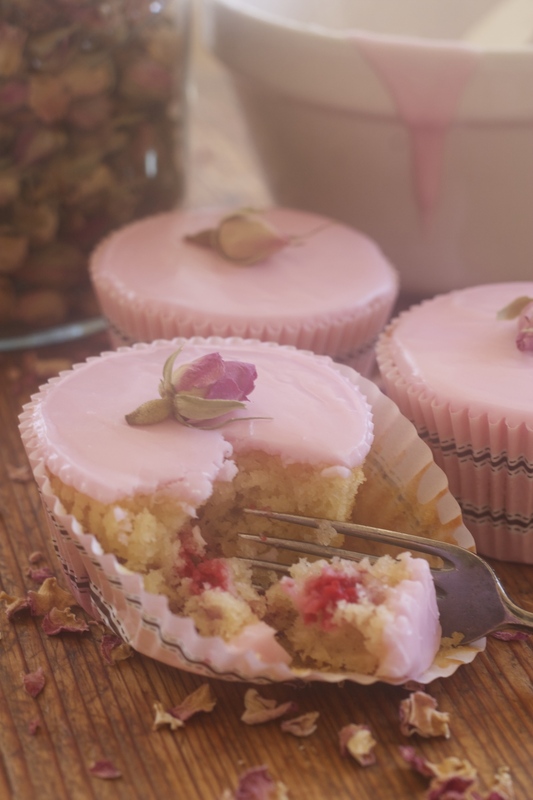 The original recipe for the cupcakes can be found in ‘The Australian Women’s Weekly Cakes and Slices Cookbook’ p. 89. Originally Posted April 27, 2014.